One of the great losses to the racing world was that Audi’s last Le Mans car never raced. Here’s an idea: Turn it into an electric car and put it into production. 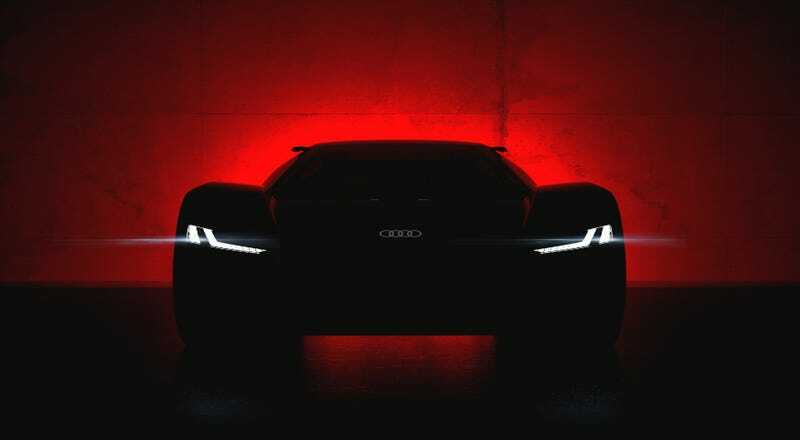 The above car is called the Audi PB 18 e-tron. It’s an electric car, and though its name implies lead (Pb) acid batteries, the PB stands for Pebble Beach, where the car will make its debut in late August. Audi does not have a ton of details for us on the vehicle, other than that it “recalls” the R18 LMP1 car that ruled Le Mans before Dieselgate killed it. Audi will unveil an electric-drive supercar concept during the 2018 Pebble Beach Concourse d’Elegance Week. I’ll tell you why my plan is a good one. Porsche already took its old LMP1 car and turned it into a de-restricted headline-grabber, taking lap records at the Nürburgring and beyond. Good use of a car, I would say. Audi, presumably, shouldn’t let all of its R18 development sit around going obsolete. Super-expensive electric supercars are on the market already. Porsche is again taking headlines with its production Taycan electric luxury car and partnering with boutique EV supercar builder Rimac. Audi could get in on this, if it wanted to or if it felt bitter and jealous of what its neighbors in Stuttgart are up to. I there is one motivating force in the German auto industry, it’s jealousy. I hope that gets this Audi e-thing into someone’s hands. That or it will just be a styling study. It’ll probably just be a styling study. Oh well.